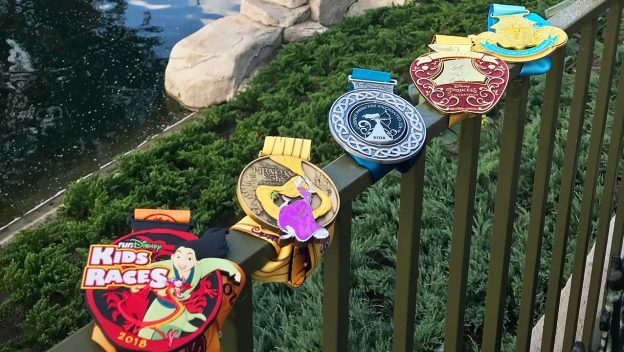 The 2018 Disney Princess Half Marathon is the 10th anniversary of the popular race weekend and Disney has revealed the finisher medals for the races. The Disney Princess 5K finisher medal features Rapunzel from the animated film Tangled. The 10K finisher medal features Merida from Brave, with a Celtic design on the medal. Finishers of the Disney Princess Half Marathon will receive a Snow White and the Seven Dwarfs-inspired medal that resembles a ruby red apple. The finishers of the Disney Fairy Tale Challenge – the 10K and half marathon – will receive a medal that looks just like Cinderella’s carriage. The medal also incorporates the 5th anniversary of this challenge. The Kids’ Race medal feature Mulan. The 2018 Disney Princess Half Marathon is February 22-25. All races are sold out.